Did you miss Tech Day Camp last year? Did you go and can’t wait for the next one? 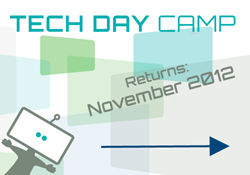 Tech Day Camp is a one day EVENT for those who want to learn and understand more about technology and how to make it work in their lives. Who should attend? Technology beginners, intermediates, and even those who think they know it all. . .the dad, the mom, the grandmother, the business person. . .anyone who would like to better use technology to make lives easier and cooler. What you will find: The ‘how to’ and why on: Facebook, Twitter, Google, blogging, photo enhancing, “the cloud”, QuickBooks, the web, WordPress, video, the iPad, basic computer classes, self-publishing, and so much more.